FABB met Brad Crohn, a resident of Ballston, on Bike to Work Day at the Tysons pitstop. Brad regularly commutes to his job in Tysons. He says he does it for the exercise and for the “freedom of it all.” In response to our question about what he would like to see to make bicycling better in Fairfax County, Brad said he would like to see more bike lanes on main roads. FABB actively advocates for Fairfax County and the Virginia Department of Transportation to continue adding bike lanes, shoulders and wide curb lanes to routes in and around Tysons. FABB continues to encourage people who ride bikes or love someone who does to make their voices heard on improving bicycling infrastructure and safety at public hearings publicized on this blog site. Join FABB for a casual bike ride on Sunday, October 9 starting at 2 p.m. We will visit two county, two regional, and one national park, all within a short distance of Tysons. The ride begins at Meadowlark Gardens Botanical Park and will travel along the NoVi (Northern Vienna) Trail Network, including the newly completed portion on Beulah Road. Register on Eventbrite. The Beulah trail is part of a bike-friendly route to Wolf Trap National Park's The Barns of Wolf Trap and the Filene Center. 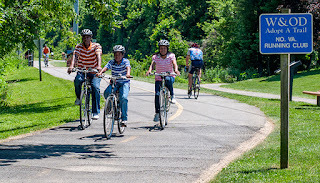 We will return to the W&OD Trail and ride to the Meadowlark Connector Trail which leads back to Meadowlark Gardens. Some portions of the route are very steep and may require some riders to walk a short distance. The majority of the ride will be on trails but there are a couple of short road segments. Total distance is approximately 7-8 miles. The ride begins at 2 p.m. and will take about 2 hours, with stops along the way to discuss how the trail system was created. Joining us will be Jenifer Joy Madden, Vice Chair of the Fairfax County Transportation Advisory Commission and the NoVi Trail Network’s chief advocate.The ride concludes back at Meadowlark for refreshments where Jenifer will tell us a bit about her new book, How To Be a Durable Human, which tells the NoVi story and includes tips for making your own community more bike- and walk-friendly. All riders must have a helmet and sign a ride waiver. The ride is free and you can register using the FABB Social Ride Eventbrite page. Fairfax County Department of Transportation (FCDOT) will host a Little River Turnpike Bicycle Study community meeting on Sept. 26, 2016, from 6:30-8:30 p.m., to discuss ways to improve bicycling along the Little River Turnpike from the City of Fairfax to Alexandria. The meeting will be held at the cafeteria of Annandale High School, 4700 Medford Drive, Annadale. At the meeting, FCDOT staff will be presenting recommended concepts for projects to implement in the short-term, and long-term recommendations for the corridor. FCDOT is seeking feedback on the recommended concepts and for prioritizing projects for implementation. Fairfax County Department of Transportation hosted a community meeting on May 17 to discuss ways to improve bicycling along Little River Turnpike from the City of Fairfax to Alexandria. The purpose of the meeting was to gather information from the public on existing conditions, problem locations, and short- and long-term improvements that will make bicycling viable in this corridor. Little River Turnpike Bicycle Study Interactive Map: tell us your transportation concerns along the corridor. It is always great to see parents and kids biking together, especially on Bike to Work Day. 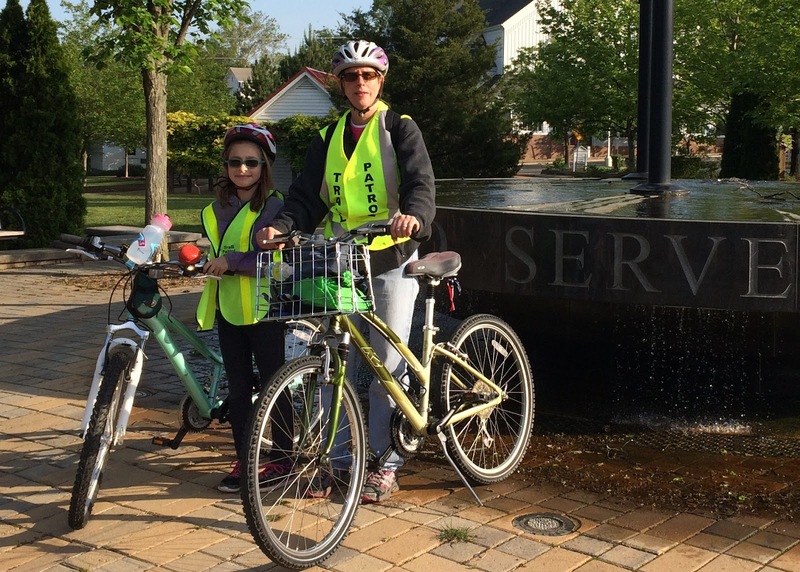 April and Autumn Giresi of Vienna were showing their civic spirit by volunteering for Trail Patrol duty. 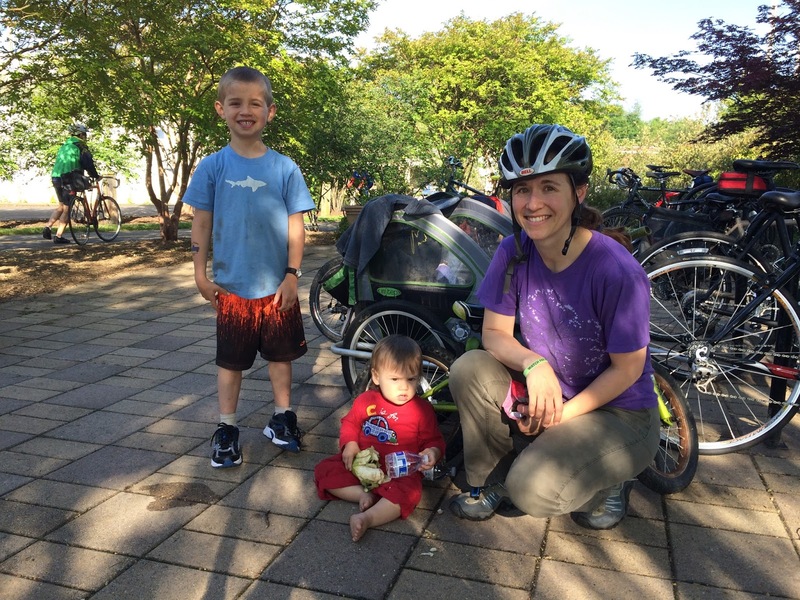 Jessica Brew was staying active by riding with sons, Ben, Theodore, and Samuel (although Theodore was a little too active to pause for a photo). FABB supports biking for all ages. Our group has worked for years to support the Safe Routes to School program and encourage biking to school every day. We are ready to assist interested groups with planning and sponsoring activities and with identifying safe routes to encourage children to bike and walk to school. Fairfax County and VDOT have been busy this summer creating bike lanes around the county. Kudos to Fairfax Co and VDOT. Kudos also to everyone who advocated for and developed the county's Bicycle Master Plan. Without the plan these facilities would likely not have been built. Also, 3.5 miles in upgraded buffered bike lanes are now in place on Telegraph Road (Lee District) from the Fairfax County Parkway to Hilltop Village Center Drive, and features the County’s first bicycle two-stage left turn. Fairfax County currently has 368 miles of bike lanes, shared-use paths and trails, which includes approximately 70 miles of on-street facilities. The County’s goal of creating a 1,130-mile bike network was approved by the Board of Supervisors in the Bicycle Master Plan in Fall 2014. The bike lanes are a part of VDOT’s repaving program, which gives the Commonwealth and County Departments of Transportation an opportunity to identify, design and implement bike projects on roads that were already included in the repaving plan. Improvements included shifting or narrowing lanes to accommodate bike lanes; placing shared-lane markings, known as “sharrows,” on the road to help increase awareness of cyclist activity; and “road diets,” which reduce travel lanes to help reduce speeding and increase safety. Please join us this Tuesday evening for our monthly meeting, which is being held in the Sully District with Supervisor Kathy Smith as our invited guest speaker. The meeting will begin at 7:30 pm in the Frank Room of the Sully Governmental Center at 4900 Stonecroft Boulevard. Much is happening in the Sully District of importance to bicycling. The planned I-66 parallel bikeway would connect thousands of western Fairfax residents to destinations around the county and make it easier to commute and shop by bicycle. We'll also learn about ongoing projects such as the Historic Sully Cycle Tour and wayfinding signage on Fairfax County Parkway from Fairfax County Bicycle Coordinator Adam Lind. A FABB representative will also facilitate a group discussion about local residents' views of improvements needed in the district. We hope to see you on Tuesday night! FABB had to talk to Edward Myers when he and his “solar bike car” stopped at the Vienna pitstop on Bike to Work Day. Ed commutes from Sterling to his job in Tysons and also bikes for exercise. His Solar Bike Car project, which he discusses in detail at his website, is about exploring an innovative combination of exercise, transportation, fun, and safety. Ed is all about efficiency and, of course, few things are more efficient than a bike. 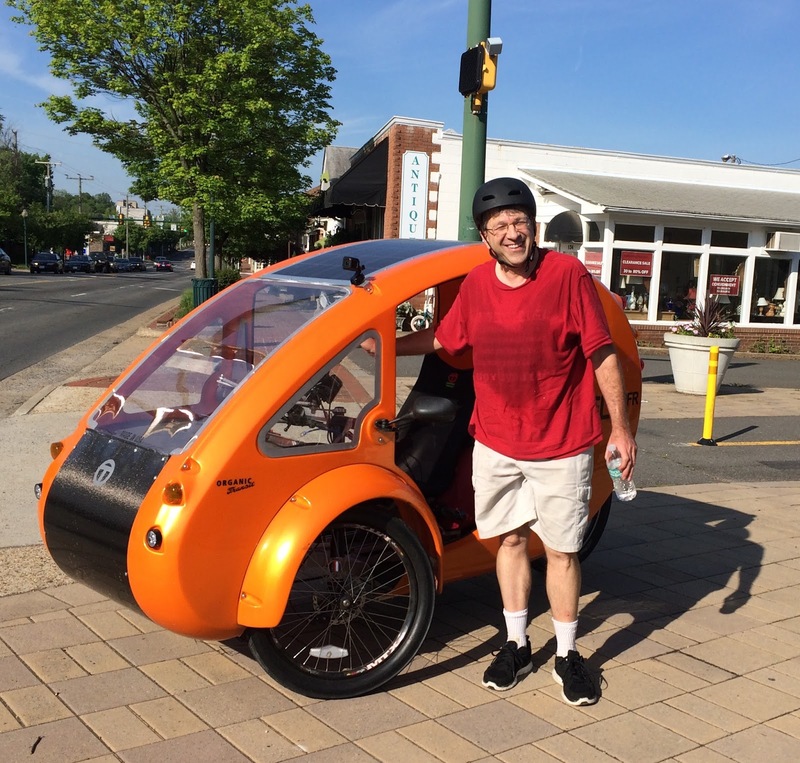 Ed’s “bike” is an ELF two-seat recumbent tricycle with a shell enclosure and an electric assist motor powered by a solar panel-charged battery. Because it is relatively large compared to regular bicycles, the ELF’s use on multi-use trails like the W&OD has been controversial. For FABB, this merely underscores the need for more multimodal transportation facilities in the county and for more education and enforcement efforts to insure that everyone—cyclists, motorists, and pedestrians—know the rules of the road and multi-use trails. For some people Car Free Day is every day. Most cyclists can go car free on many days but especially in Fairfax County, it's not easy to get by without a car. 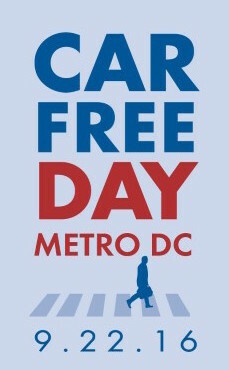 The official Car Free Day in Metro DC is Thursday, September 22. Why not pledge to go car free on that day? Besides the satisfaction of going car free, there are also prizes. So far the majority of people who have taken the pledge are bicyclists. Scroll down to the bottom of the Car Free Day page to see the breakout of car free options. Those bicyclists may also be taking transit and walking but they identify as bicyclists. FABB is working to improve biking so that everyone has the option to travel safely by bike. The number one reason people don't bike is because they don't think it's safe. We are your local advocacy group working with VDOT, county staff, county Supervisors, and others to support bike lanes, cycle tracks, bike education in the schools, bike parking, etc. Have you marked your calendar and made plans to be in Reston next Friday night, September 16th, for the Clips Beer and Film Tour? It is going to be a great event, and we would love to see you there. Our partner, New Belgium Brewing, is bringing a wide selection of its tasty craft beers. There will be games to play while we wait for darkness to fall. 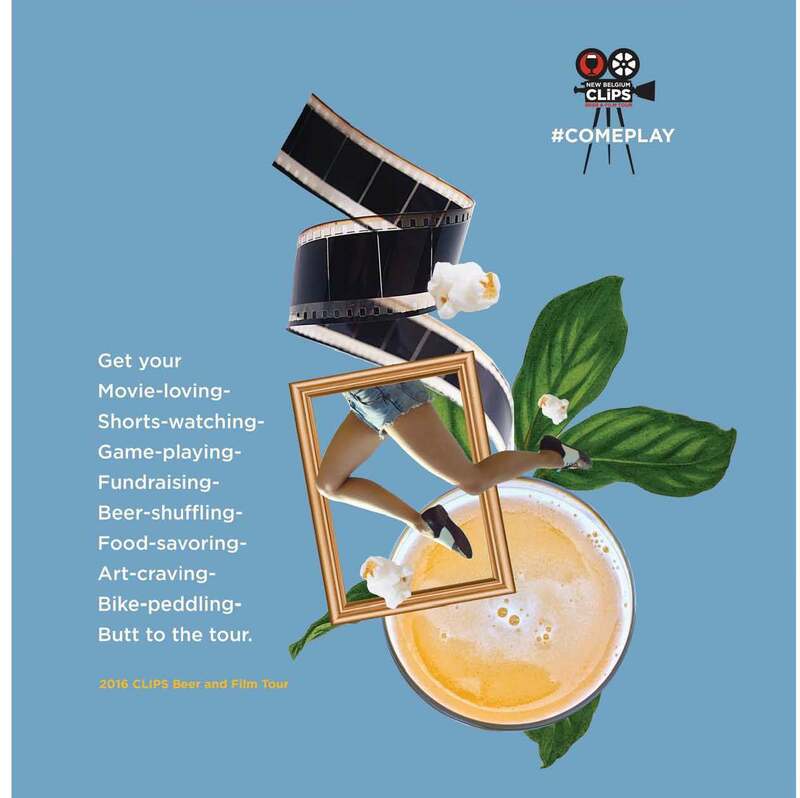 Plus food vendors will be there, so you can get something to eat while you watch a series of interesting and exciting film shorts that will be projected on a large outdoor screen in the middle of Reston Town Center. Thanks to New Belgium’s generosity, all beer proceeds from the event go to FABB. This money, in turn, will go toward FABB’s efforts to make Fairfax County a bike-friendly community. FABB looks forward to your support at Clips and in our ongoing efforts to advocate for more bike and pedestrian facilities, to encourage cycling among all groups and ages, and to educate riders and motorists alike about safe and responsible cycling. More information is available on FABB’s Clips webpage here. We still need some volunteers to fill the remaining spots helping out at the box office and serving beers. If you can help, please sign up here. The Town of Vienna has applied to be a Bicycle Friendly Community. As part of the process with the League of American Bicyclists, residents are invited to take a brief Bicycle Friendly Community survey. The survey is short and asks a number of basic questions about biking in Vienna. 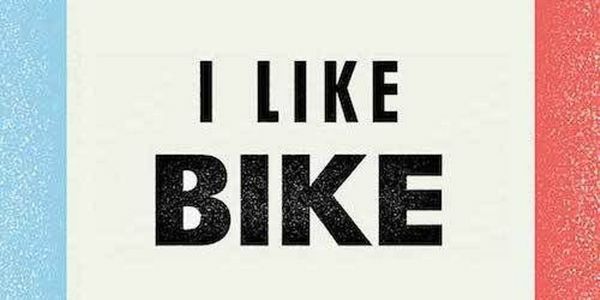 The best part about applying for Bicycle Friendly Community status is going through the application with Town staff, letting them know what it takes to be a good place to bike. Communities then receive feedback from the League of American Bicyclists on ways they can improve their biking environment, including infrastructure, bicycle safety education, enforcement, counting of bicyclists, and ways to encourage more people to bike. Good luck Vienna. Bike Hack Night is a show & tell of bicycle-related apps, data visualizations, and gadgets. We are thrilled to be co-sponsored by REI, which has invited us to the REI Community Space at Wunder Garten as part of the #unitedoutside celebration. And thanks to co-sponsor Mobility Lab for making this event possible. REI will be providing s'mores, and beer will be available for purchase. At this point we are not expecting a food truck on premises, but you are welcome to bring your own food. Doors open at 6:00. Speakers begin at 6:30. Because we're expecting a large crowd, consider bringing a laptop or tablet to follow along with the presentations. Ling Dao paused briefly at the Tysons pitstop on Bike to Work Day to speak to FABB. He told us that regularly bikes to work in Tysons but that he also rides because it “makes me feel good.” Apparently a confident biker, he is relatively satisfied with biking conditions in the county. FABB recognizes that there are experienced and confident cyclists who will ride regardless of conditions. But these riders seldom account for more than a small percentage of all of the potential people who might commute by bike or use bikes for short trips. The key factor is safety. When people think they can ride safely on dedicated bicycling infrastructure, they will do so. This is why FABB continues to advocate for more infrastructure, especially dedicated bike lanes, and is looking to build even greater popular support for the inclusion of bicycle infrastructure and education in Fairfax County’s future transportation plans. The Potomac Pedalers are leading a bike train on Friday, 16 September, to the Clips Beer and Film Tour. The train will depart at 6:30 pm from the East Falls Church Metro and proceed to Reston Town Center on the W&OD Trail. Participants will get high fives from the New Belgium Brewery and FABB volunteers along with the opportunity to sample craft beers and watch some great short films. You can find more details on the ride and sign up on the Potomac Pedalers Clips ride page. It will be a great outing! Don’t forget to bring lights.